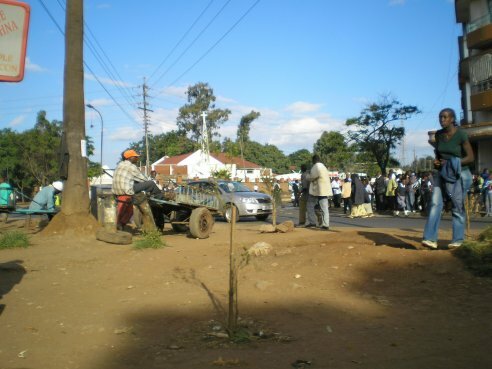 Kenya Travel Story - "A trip to Nairobi"
"In the beginning of 2007 I spent 10 days in Nairobi with 2 friends. We were there for the World Social Forum (WSF) and also spent a short vacation there. The city was full of WSF visitors. We were late with finding a place to stay. Luckily an Italian friend of mine, who was often in Nairobi for her work, found a place for me. It was her own apartment in the Longonot Apartment complex, next to the famous Norfolk Hotel at the Harry Thuku Road. She had rented it for some time and as she came back home, she knew it was empty. We got it for 50,000 shillings (some 700 dollars) for the whole 10 days. Our flight was delayed for 8 hours and we heard the flight crew protesting that they still had to fly to Nairobi, as they had a long shift…. When the speakers announced that the crew had decided to follow through with the flight, a massive applause went up and we could board the airplane, a big Boeing 747. After 10 hours of watching movies and listening to the music program, we landed in Nairobi after midnight. We took a taxi, arrived in our guarded apartment and got into bed immediately. We were exhausted! When we woke the next morning and opened the balcony doors, it was great! The sun was shining fiercely, people were busy on the street outside, and Nairobi looked oh so intriguing. I was the first to wake up, quickly got dressed and walk out the door. I asked the Longonot guards whether there was any supermarket. They showed me a supermarket a mile away, and I walked there. It was a modern supermarket, except for the occasional cockroach between the dairy products, and they carried many Western brands next to Kenyan and products from Arab countries. The price level was about 75 percent of Italian supermarkets. Clearly only the well-off Kenyans could buy here. I bought everything for breakfast, and when my friends woke up on their first morning in Africa, breakfast was cooked and ready at our balcony. The next days we would be at the World Social Forum which was held in Kasarani, a city part a few miles from the city centre where we stayed. 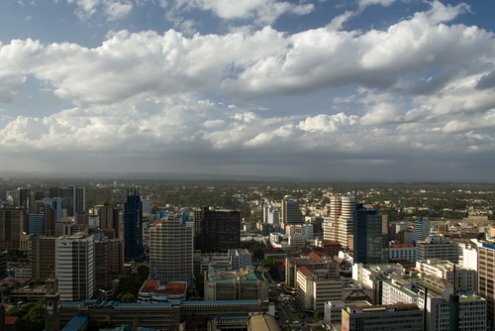 Over 70,000 people attended the event, most of them from Kenya and other countries in the region, and about 15,000 from all over the world. ..."